Program #PARM030. Recorded in Burlington, VT on April 9, 1986. 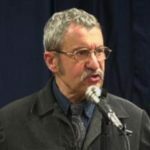 “I’ve been kicked out of some of the best universities in the U.S,” declares Michael Parenti. He recounts how his political activism cost him jobs in Vermont and Illinois. Among the charges leveled against him were, “bad for the image of the university;” “anti-business attitudes;” and “unprofessional conduct” for refusing to pledge allegiance to the flag at a Rotary Club event off campus. Parenti describes how the academy has become increasingly corporatized and is run by boards of trustees who are unaccountable.Universities and colleges give “lip service to certain ideals” Parenti says, but they are “riddled with class and ideological biases.” This is a spirited and energetic talk. Vintage Parenti. Recorded at the University of Vermont.